Inside every smartphone camera beats a heart that yearns to be a DSLR. The features are there but, like Sleeping Beauty, they need a few digital kisses to awaken them. Pictar Pro does that and more. Through an integrated software app, it will add of dozens of options that can be accessed with external controls, just like a “real” camera. It doesn’t just make your phone feel like a DSLR (or mirrorless) camera; it also lets you have a myriad of creative choices that will elevate your images to a new level. View of Pictar Pro facing the subject with iPhone slid into place. Other smartphones are also supported. This clever blend of hardware and software works with most smartphones– iPhones, Androids, Sony and more, enabling them to boldly go where no smartphone cameras have gone before. Simply download the app, snap on Pictar Pro, and you’re ready to shoot. miggo (with a small “m”), is an Israeli firm with a successful history of bringing innovative photographic gear to market. 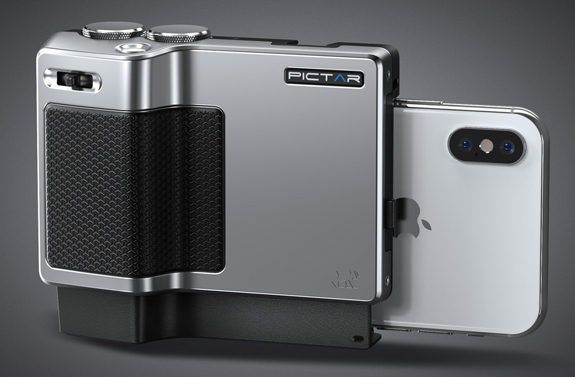 They launched a Kickstarter compaign last year with the goal of raising $25,000 in pre-orders to fund the Pictar Pro. In just a few weeks, backers had pledged $348,655. Then the company raised an additional $393,189 on Indiegogo. Relying on their previous experience of successfully producing less sophisticated smartphone camera upgrades (that are still available), the company has pulled out the stops this time to produce a professional model with additional features. According to miggo, smartphone camera potentials aren’t fully realized. Despite the fact that Apple and Android smartphone makers invest tens of millions of dollars yearly in optical lens development, most users don’t take full advantage of their smartphone’s photography tools. Furthermore, controlling the smartphone’s camera through menus can bog down the photographer. Top view of Pictar Pro with smartphone slid in place showing shutter release (at top right) and two control wheels below. A total of four external control wheels and buttons for easy one hand and one-touch use for better control over the camera’s features and for sharper pictures. Exposure compensation wheel for superior control over the exposure and darkness or brightness of the image. Multi-state Shutter Release button offers two modes: a half-press to lock the focus and exposure, and a full click to shoot. Rocker Zoom Switch for ease of use and continuous smooth motion of the zoom, even in video shooting. It can be pressed to change from the front camera to the back one for selfies. Smart Wheel – Rotate the wheel left and right to switch between 9 different shooting modes: Auto, Shutter Priority, ISO Priority, Manual, Macro, Video, Selfie, Sport and Filters. (NOTE: There’s no aperture priority option because smartphone cameras have fixed apertures). Press the wheel to switch between the different flash modes. The button can be easily programmed to change its function via the application. 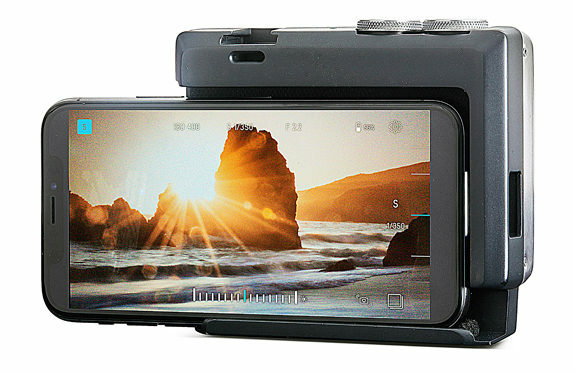 Viewfinder, which easily connects to see the smartphone’s screen even on a very bright day or for more conventional eye-level viewing that many DSLR/mirrorless camera users are used to. Qi wireless charging via an internal battery to keep smartphone going to never miss a great shot. Shutter speed control for “freezing” or blurring the image. ISO control to reduce artifacts or for low lighting capture. Larger zoom range over iPhone to get even closer to the object. Advanced image formats: jpeg / tiff / raw for larger and more detailed files. (Note: Not all smartphone cameras support tiff and/or raw). Multi-featured camera app (free) for better performance and many more options. Tripod attachment great for night photography, long exposures and family selfies. Breakthrough wireless connectivity to connect to Pictar Pro to the Pictar App, transferring commands from the various buttons using patented technology of high frequency sound waves (not audible to the human ear) rather than power-consuming and sometimes unreliable other methods. Here’s what you see with smartphone in place. Settings options appear on the screen. One of most interesting features of the Pictar Pro is the optional eye-level viewfinder which clips onto the screen and automatically reduces the size of the image to be viewed. Most DSLR photographers using smartphones dislike holding the screen away from them and having to tap it to make an exposure. Aside from loss of stability, which can lead to blurred and unsharp images when printed even at moderate sizes, screens frequently get washed out from bright sunlight hitting them. With Pictar Pro’s conventional shutter button release and the eye level viewfinder, these problems are eliminated. 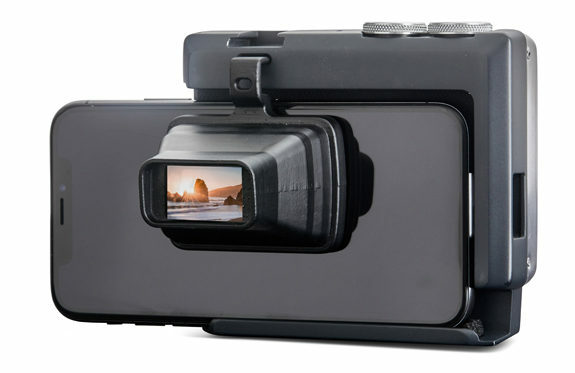 When you snap the accessory viewfinder in place, the image is automatically reduced for DSLR style close-eye viewing and the big screen goes dark. All of Pictar Pro’s features are explained in detail at their Kickstarter site which is still up but no longer active. Same with the Indiegogo site. Or you can learn more at miggo’s site. (See Resources for links). The Pictar Pro would be a perfect companion when you don’t want to drag a lot of conventional equipment along on a pleasure trip. For hikers and campers it’s an ideal concept; it weighs only a few ounces and you’d be carrying your smart phone with you, anyway. And speaking of that, when Pictar Pro is in use, all smartphone functions, like sending or receiving calls or messages operate normally. 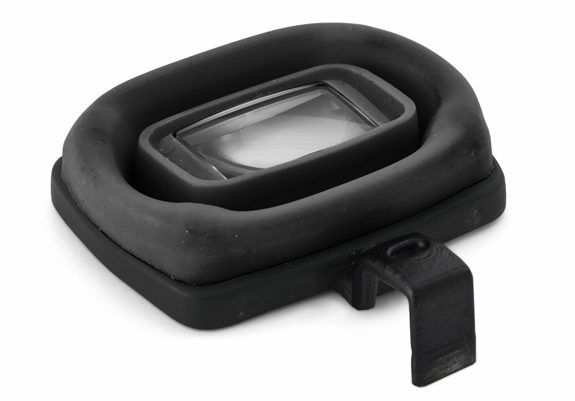 Close-up of the foldable eye-level accessory. This is a game-changer in smartphone camera accessory technology. Don’t underestimate the camera power in today’s smartphones or the quality of images that can be produced. It’s one of the more expensive components in your phone and will now be capable of performing many more photographic functions when used with Pictar Pro’s mechanical interface and software. The Pictar Pro is one of the most innovative inventions in the field of photography. If you want to get the ultimate results from your smartphone camera, this extraordinary add-on will give you the ability to make better images than ever before. The Pictar Pro will be available for retail sales at miggo and other photo sales outlets in June 2019 at a retail price of $245 for a package consisting of the Pictar Pro unit, carrying case, neck strap, wrist strap, viewfinder, charging cable, and Pictar app. It is anticipated that it will sell for less at major online photo outlets. Kickstarter site for more detailed info. Click here. Indiegogo site for info. Click here. Other Pictar models. Click here. I don’t get it. If you want a camera, use a camera. The point of a smartphone is a device that you can slip in a pocket and always have with you. The Pictar accessory lets you get more features out of your smartphone camera so that carrying an additional heavier camera and lens is not always necessary. Most photographers (even pros) never use 90% of their DSLR camera’s features anyway. So, yes, when you need them, use it. But when you don’t, this is a perfect equipment compromise that will allow your smartphone’s camera to produce excellent images as long as you don’t intend to blow them up to a humongous size.